Figured it was about time to tear myself away from robotics and animatronics for a bit to at least get a quick post out. I’ve been spending a lot of time working up some new Halloween prop structures to add to my Haunted Trail collection next year. I know, I know it is a long way from now (Linda reminded me of just that fact earlier today), but my new PVC form structures design is now fully jointed and just begging to have some servos added to it. I haven’t worked with this stuff since college so a little rusty on – watching a lot of videos and reading what I can to figure out what options are out there. Tomorrow is a run to Menards to get some materials to make a few motion sensors as a start. When I noticed it was suppose to snow (again) tomorrow including our first accumulation. I thought it was fitting to feature a post on one of my favorite Winter subjects. 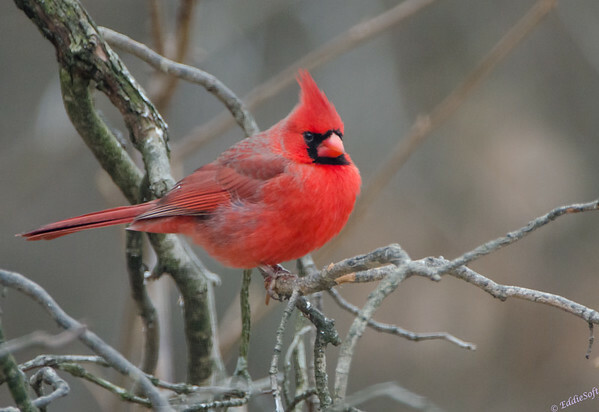 That’s right, the Northern Cardinal. 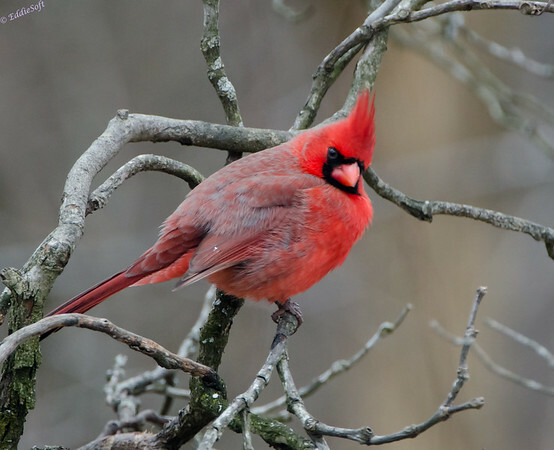 There are a few things I always find very pleasing from a composition perspective and one of them is photographs of Cardinals in the Winter months. Typically the Winter days can range from a rather drab day to an all out white out depending on how the season is going.. oh sorry, maybe I should refer to it as “how the ‘climate change’ is going” just to fit into the cool crowd that doesn’t realize climate is suppose changes when you move out of California. The best part of photographing Cardinals is it doesn’t matter how bad the weather is, the Cardinal always stands out against whatever backdrop you happen to be around. These happened to be taken in our backyard a year or so back. 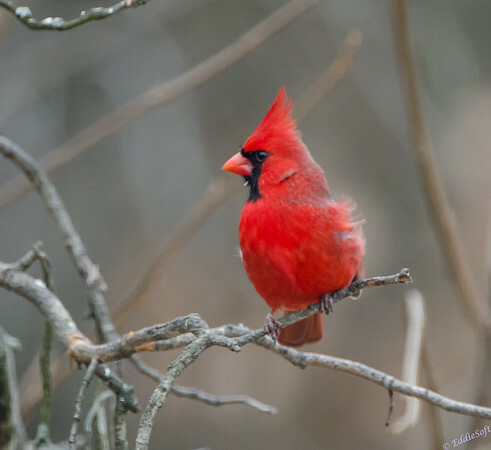 If there is one bird we have plenty of here in the Midwest it is the Cardinal. I think my record for number of those fiery birds is 26 at one time. They definitely like our feeders with Sunflowers. 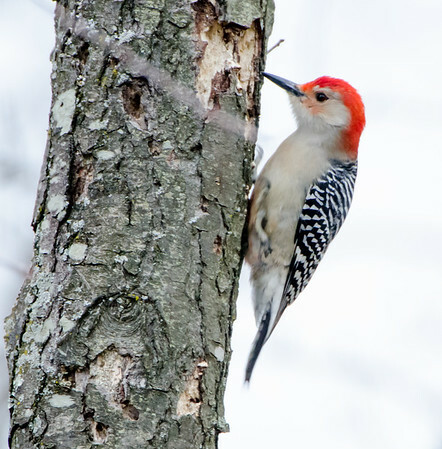 By nature, these birds tend to hit the feeders, grab some seed and then fly back to the safety of the branches in the trees just off the porch – definitely not at the same skittish degree as the Nuthatches or Chickadees). It is always better for us nature photographers when you have a predictable subject. Hit the jump to see some more shots of this beautiful bird .. and maybe I’ll throw in bonus bird! Add in the fact that they are pretty well acclimated to us being around and you have perfect conditions for some nice shots. Since it is a fairly common bird around here and I have lots and lots of shots of them, I try to go for the more interesting poses – something different that gives the composition a little more appeal over the traditional bird reference shots. Don’t you think the shot above and the one below just have a bit more appeal than the typical stoic shots you typically see? As mentioned, the Cardinal takes up quite a bit of my storage capacity. They have made their way onto this blog several times, for example the link here. That particular post was more of a Summertime shot. I do really like the third Cardinal shot on that previous post and if you looked close at the U.B. competition this year (link here) you will notice it took a second place to the Best in Show offering this year. I even had it printed and gave it to my Mother since I know she likes Cardinals. With that said (err typed), I still prefer the Winter shots. Another cool thing about these birds is they are aerodynamic. Check out this one – looks like he’s in a wind tunnel checking out his new punk feather do. Let’s not forget the ladies. They definitely lack the vibrancy of their male counterparts, but they still have a dash of red that gives them a more subdued but sophisticated appearance. This particular one was making a point to keep at least one branch between her and the big glass of The Beast. This makes it a tad difficult to get the focus sharp without opting for manual or simply changing the focus point off of center weighting. I opted for the latter in this case since Nikon makes that whole process easy and effective – can pretty much do it without taking my eye from the viewer. 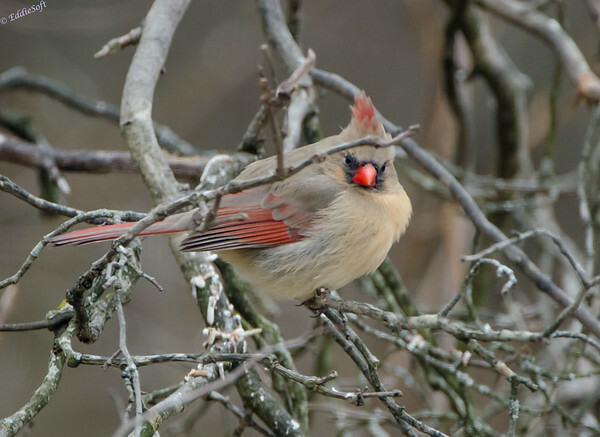 This next shot caught my attention due to the nice symmetry of the Cardinal’s body line with the branch .. might as well incorporate it if she’s going to hide behind it. Eventually she moved to a better location but then it occurred to me why she was probably hanging back in the branches – not so much being shy of the glass, but more likely to help stay out of the wind. As with the male shot above, you can visualize the wind element in the shot below – almost gives it that extra burr element to coincide with the Winter setting. While putting the Cardinal shots together I noticed another bird in the queue. Figured it had a similar distinguishing feature so went ahead and added it to the set. A special bonus today – two featured birds! 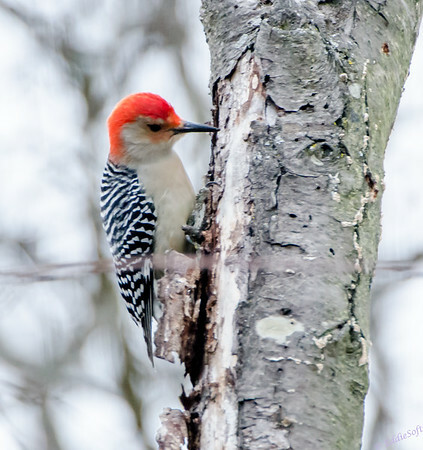 For those not familiar with this particular bird (and that would likely mean you don’t get out into the country much), it is a Red-Bellied Woodpecker. 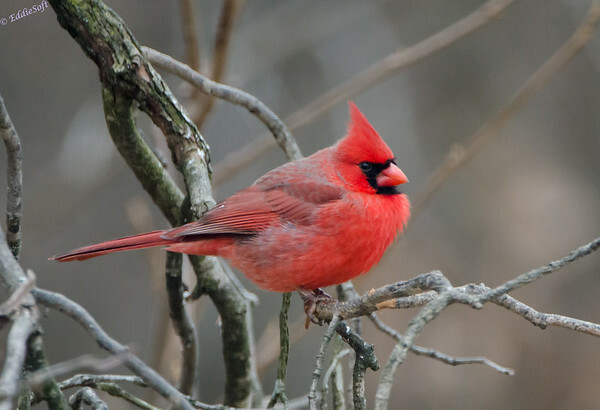 I’ve personally always wondered about who named this particular bird since it really doesn’t have a distinctive redness on the belly – well, that I’ve ever seen. 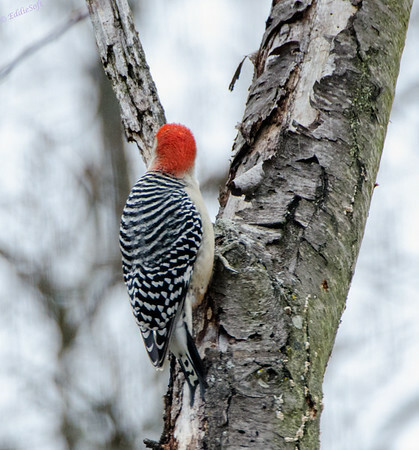 Guessing by the time this species was named, the Red Headed version was already identified or we might be calling that one the White Bellied Woodpecker and this one the Red Headed variety. Sorry for the annoying branch in the shot above and below. Must have overlooked it in the viewfinder when taking the shot or I’d have taken the time to move a few feet to eliminate that annoying element. Note, the red Mohawk the Red Bellied version sports is pretty cool. I’ve always thought the laddering on their backs was their best feature. This is the element that I go to first when trying to classify them in the field. There are a few other Woodpeckers that sport this zebra look like the Gila and the Golden-Fronted but those are not to the same degree. Technically the Downies have it a bit but their smaller statue dismisses them pretty quick. Forgot about the Ladder-Backed (yes, I went back to the reference manuals to do some quick validation). Confirmed it does have it as you would expect from the name, but their limited region puts it out of reach for me. That’s about it for the shots. Just wanted to get something out there in case you were feeling neglected. Now back to servos and motion sensors. Wow, wow, am I behind in your posts… I take it that you took the opportunity when I’ve been so busy to try to get some of these posts past me. No way, (Brian) Jose(ph Doerfler). 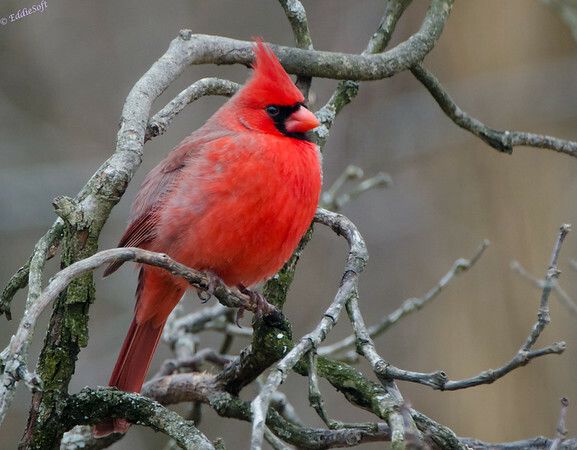 That’s a beautiful pair of Cardinals (BTW, Northern Cardinals, not American Cardinals). 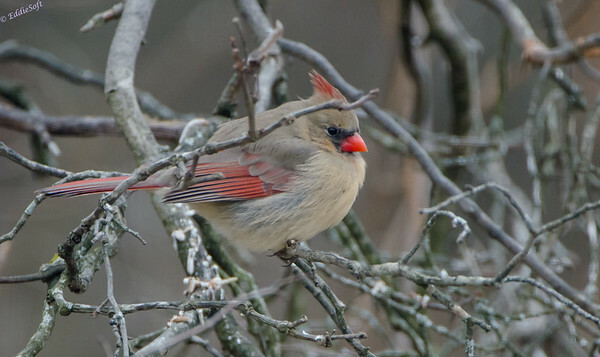 The female is particularly striking compared to the average female Cardinal I’ve seen. 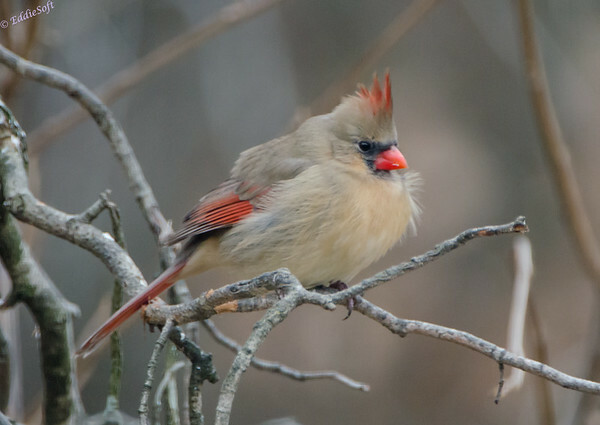 I’ve come to appreciate the coloring of female Cardinals—more elegant, really. 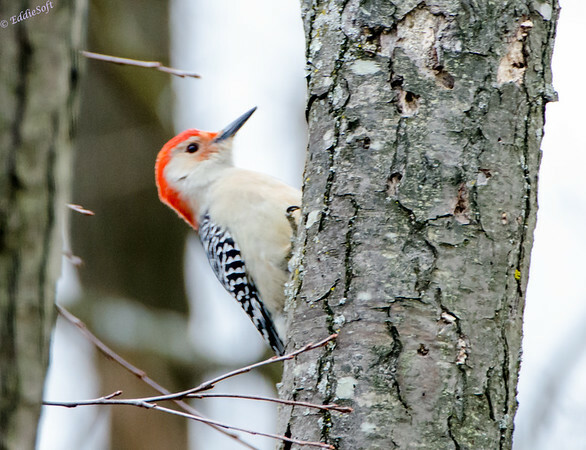 I was wondering myself why the call it the Red-Bellied Woodpecker, but there may be a touch of pink on the belly in the second woodpecker picture. Really cool birds. Ooops, all your recent comments went into my Google Mail spam folder for some unknown reason – have that fixed now and obviously have a bit of catching up to do myself. You know, only Mom is allowed to use my middle name! … well, and Linda when she is annoyed with me .. but that’s IT regardless of how clever it is used! 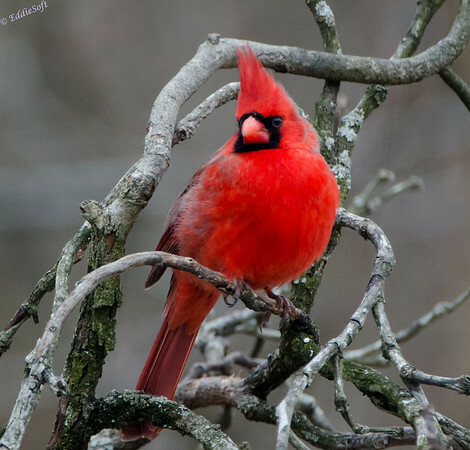 It is a Northern Cardinal – I was confused but now corrected – thanks for that assist. 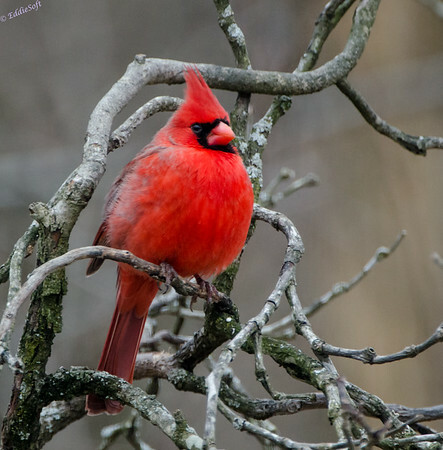 I find the Winter setting is the perfect backdrop for the Cardinals – the muted grays seems to really make the red on those Cardinals really pop. I ended up printing the first shot on our new printer and it turned out awesome.